I was introduced to the new (beta) nav system yesterday and I must say that I like it a lot. 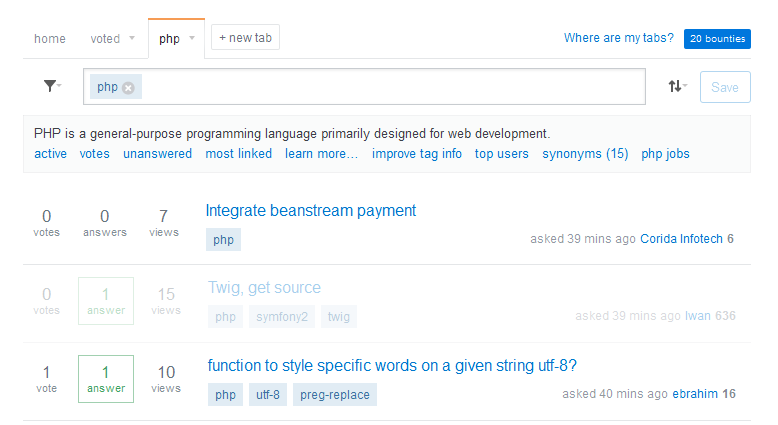 However, there is something that I seem to be unable to find/do in order to get back to the newest (php) posts on StackOverflow.com which is the main tag I follow. Note: This is the case for any tag and isn't php-specific. When I am in the php thread and I click on the "2" pagination (or any other number), I don't know how to get back to the main php tagged page to see the newest php posts. I literally have to click on the "php" tag on one of the questions in the thread (or a question) in order to get back to the newest posts, or page 1 at the bottom's pagination (see the edit below regarding test(s) performed). I spent quite a lot of time in order to find an option to do this, but alas to no avail. Is there something I've missed or I don't know about? Sidenote: I added the "feature request" tag, since I am unsure if it is a bug (should it be tagged as a bug?) or it should be a feature request. Please retag accordingly if I did not tag it properly. Edit: As stated in comments: "You can also refresh. Refreshing will take you back to page one." That does work, however I shouldn't have to refresh the page. I believe there should be a way to click on the tag so that it does go back to the newest posts or clicking on the "Newest" tab as I used to do in the old system. On an added note; if I clicked on page 2 or any other pagination number, I should be able to see the posts on those pages when refreshing it as done in the old system. In refreshing the page, I then lose the questions (thread) that were shown in there, where I have to click on page 2 (or 3, 4, etc.) to get back to them again. The new (beta) system's URL doesn't change as it does in the old system. Which is why by my refreshing my browser, would bring me back to the main (newest) page. Am I forced to go back to using the previous system? Will this be taken into consideration and modified in order to be able to click on the "php" tag (or any "other" tag for that matter) that does appear as a hyperlink to https://stackoverflow.com/questions/tagged/php? As shown in the second screenshot ("Screenshot 2:") where it reads as "Clicking here does not make it go to the newest posts". Theoretically, by clicking on that "hyperlink", it should redirect to the newest questions. (Test #1:) If I click on that tagged hyperlink by opening it in a new browser tab, it does take me to the main tagged page with the newest questions shown. (Test #2:) If I click on the "home" or "voted" tab then click on (php) tag/tab after, it does show the newest questions and the pagination number at the bottom of the page is highlighted as "1". IMHO, that action should happen simply by doing a standard mouse click on the said tag, rather than a "right-click open in new tab/new window" or mouse-wheel click or clicking on another tab then back to the hyperlinked tag. Browse other questions tagged feature-request bug new-nav .